As promised, here is the banner that I made to hang on the fireplace mantle at Stolen Moments Inn. 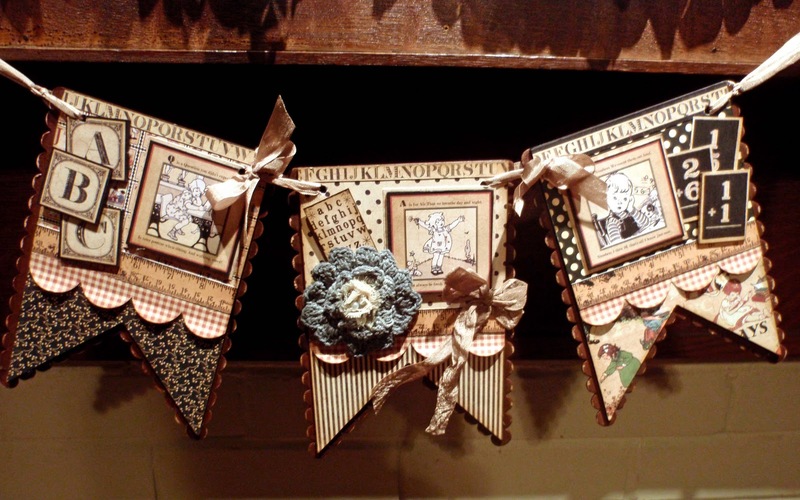 I am so in love with this paper pack from Graphic 45. I have one more project to show you and then sadly, I have used up the entire pad. Everything with the exception of the flower and seam binding comes from the paper pad. 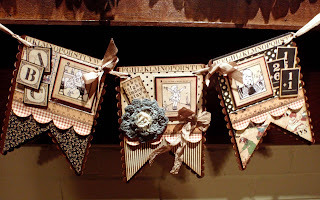 I love to make my own chipboard embellishments using cut outs from papers. They aren’t fancy, but I think they add that needed touch. The only die I used was the Simply Scallop Die from Mft Stamps. I inked it and then just adhered the very top so that the bottom would be more dimensional. Here is a closer look at each panel. If you will indulge me, I will show you my last project using this paper tomorrow.